M’Chigeeng, ON – To join in the year-long celebration of ‘The Year of Indigenous Languages’ under the United Nations Declaration, Kenjgewin Teg and Lakeview School proudly hosted the first ever Anishinaabe Booskinaagan (conversing in Anishinaabemowin) Language Bowl public speaking event. 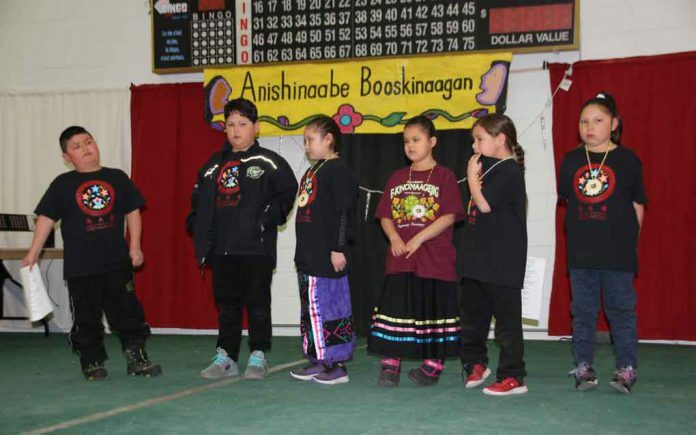 On Tuesday, March 26, students from four elementary schools gathered at the M’Chigeeng Complex to compete in front of an audience, all in their mother-tongue; the Ojibwe Language. Overall, 72 students from Biidaaban Kinoomaagegamik (Sagamok Anishnawbek), Lakeview School (M’Chigeeng First Nation), Shawanosowe School (Whitefish River First Nation) and Bkejwanong Kinomaagewgamig, (who travelled 11 hours from Walpole Island First Nation) proudly presented with their classmates. The event consisted of students who participated in Primary (Kindergarten to grade 3), Junior (grade 3 to 6) and Intermediate (grade 7 to 10) groups. Categories included a choice of Live Conversation, Contemporary Media Use or People’s Choice. 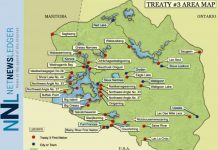 Live Conversation involved students speaking amongst themselves entirely in Ojibwe, consisting of topics that included either agreeing or disagreeing over various topics. In the People’s Choice category, a group of students demonstrated items from their classroom bundle, which involved smudging and the drum. Other groups would sing songs in Anishinaabemowin, such as Old McDonald or recited a preamble. The Contemporary Media Use category allowed the students, who were not comfortable speaking in front of large groups, to let their voice be heard in Anishinaabemowin. 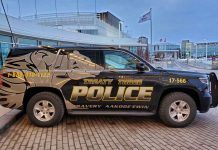 The theme for the event was to allow our children and youth to freely speak in our Ojibwe language, in ways that allowed them to feel comfortable and build their confidence in speaking and understanding Anishinaabemowin. The event was well attended and received over-whelming compliments from students, teachers, parents and Elders. The success of the event would not happen without the support of the community, schools, educators, students, Kenjgewin Teg and Lakeview School. 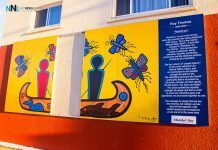 Our hope is that annual funding can be secured to host future events and continue to proudly share the growth of revitalizing our Indigenous language. Participants were awarded for their commitment to speak in front of an audience and received a certificate of participation, medal, books to read in Ojibwe and a puppet that they can use to help speak the language in the family home. Teachers/Mentors were also gifted for their involvement and encouragement. After a healthy lunch, participants returned to their schools with much excitement. Lastly, but most importantly, this event also raises awareness of the consequences of the endangerment of Indigenous languages across the world, with an aim to establish a link between language, development, peace, and reconciliation. As First Nation community schools, we need to support and encourage our students, at every opportunity, to immerse themselves in our Ojibwe Language.